Earlier this month, Mary Beth and I attended the Tall Ships Celebration in Bay City, Michigan. This festival of sailing ships is a periodic event, but this was our first time going. 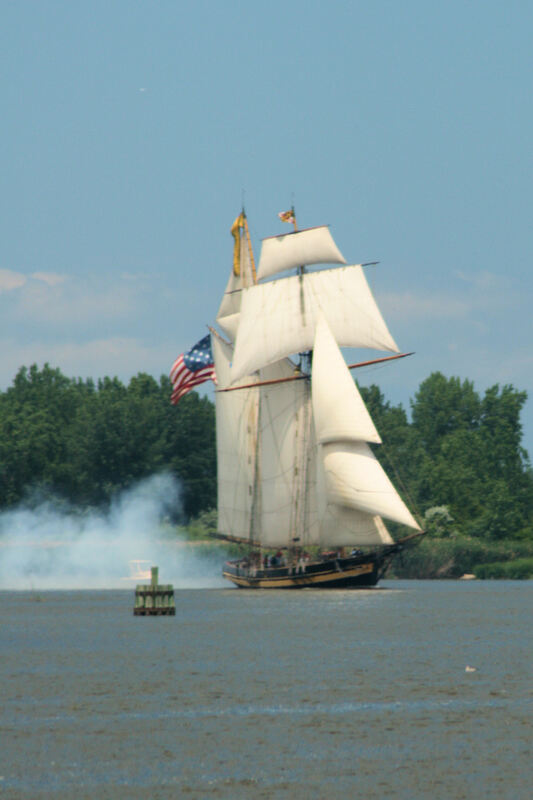 We attended on the opening Thursday and, instead of going to the docks along the Saginaw river, we thought we would travel closer to Saginaw Bay and try to see the ships coming in under sail. Now, I’m not a sailor, or even really a boater, but there is something about seeing sailing ships, especially ships of some size, coming in under the power of the wind that is thrilling to me. Our vantage point in a riverside park in Essexville, Michigan wasn’t far enough out to sea to actually see the ships coming in solely by wind power, but many of them had their sails unfurled, giving the illusion of natural propulsion. Some members of a local boating club saluted each of the eleven ships (one from as far away as Denmark) with a mock cannon blast. Each ship answered the salute, either with mock cannons of its own, or by blowing the ship’s horn. The sky was bright blue, the temperature not too hot; all in all a great day. This experience got me thinking about the US Navy. 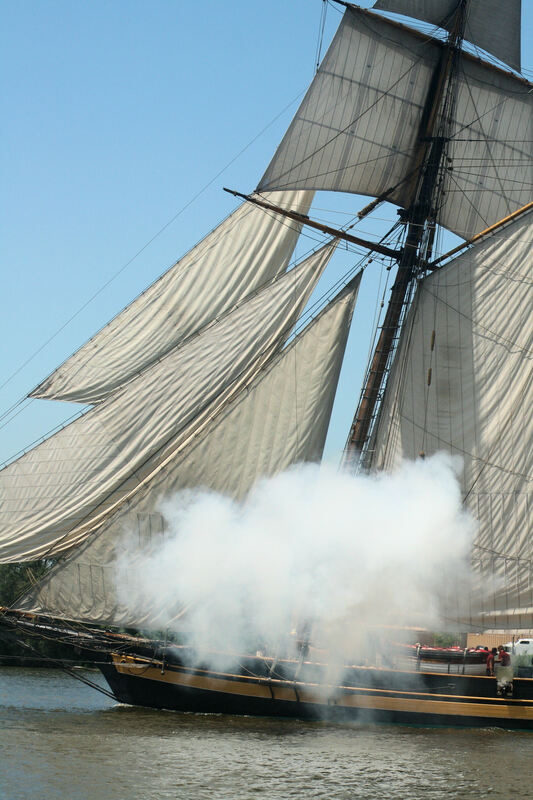 The Tall Ships Celebration website told me that some of the ships I was seeing would be participating in a mock lake battle on Labor Day, recreating a naval battle in Lake Erie during the War of 1812. I already knew how important the French fleet had been to the struggling 13 colonies during the Revolutionary War, and that without the protection of those ships, the war with Great Britain might well have been lost. I was also reminded, watching the ships enter the harbor in Bay City, of our trip to Massachusetts over the July 4th Holiday two years’ ago, when Mary Beth and I had the chance to tour the USS Constitution. 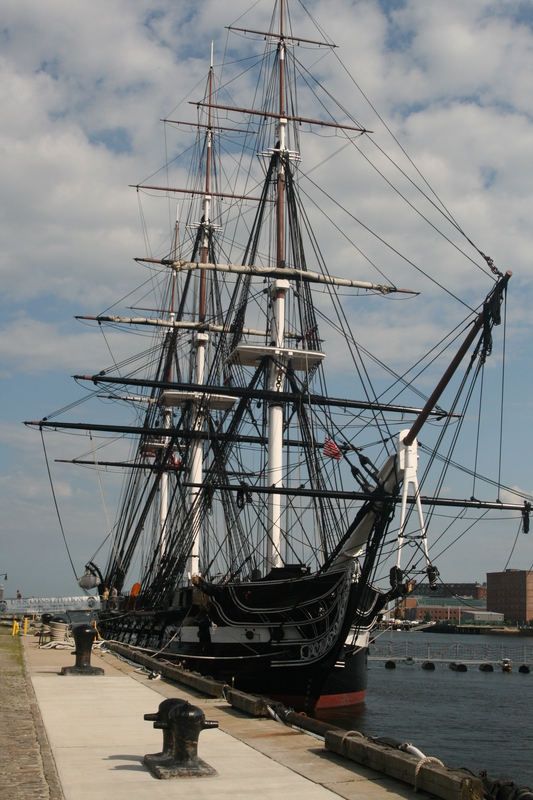 Authorized by President Washington, built in Boston, and boasting 44 guns, this oldest of all surviving US naval vessels was launched on October 21, 1797, during the first year in office of John Adams and just nine days before his 62nd birthday. Whether through superior building materials or fantastic luck, the Constitution withstood every assault aimed at her, earning her the nickname “Old Ironsides.” Much as Francis Scott Key’s ode to the “Star-Spangled Banner” sustaining over Fort McHenry, the survival and victories of the Constitution bucked up a nation desperately in need of positive news. Indeed, the victories of the Navy are thought by some historians to have played a large part in the wearing down process that finally brought Britain to the treaty table. Adams must have been very proud. We hope to see all of you at one of our performances!! 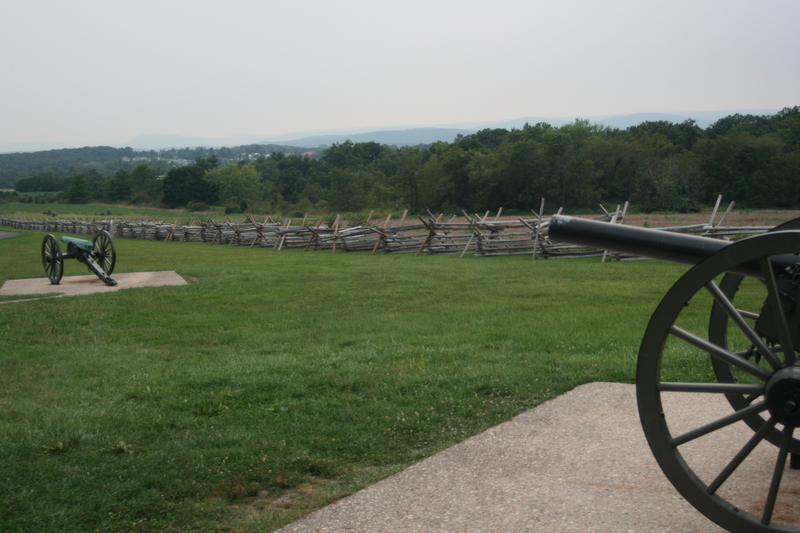 John Adams, the 4th — and Gettysburg? If you’re a follower of this blog, you know that July 4th – Independence Day – is an important yearly event for us at GEM Theatrics. John Adams, of course, was the driving force behind American independence. While not alone, it was through his efforts — his arguing, cajoling, harranguing, badgering and persuading — that the unanimous resolution for American independence was adopted. And once it was and the Declaration of Independence was signed, it was John Adams who told us how to celebrate the event. The day, he wrote, “ought to be commemorated, as the Day of Deliverance. . . . It ought to be solemnized with Pomp and Parade, with Shews, Games, Sports, Guns, Bells, Bonfires and Illuminations from one End of this Continent to the other from this Time forward forever more.” And so, it is. But even John Adams couldn’t accomplish this feat alone. Figuratively by his side through all the struggles of his life (and there were many) was Abigail. Although more than 300 miles away in Braintree, and despite having to nurture a farm and a family by herself, Abigail always found time to write to John. In her letters, she supported him, bucked him up, soothed his ruffled feathers, and ruffled them herself a time or two. I have no doubt, and he, himself acknowledged, that without her wise counsel, he would often have been unable to carry on the great responsibilities assigned to him. They are, in my view, the quintessential founding couple. And, oh yeah, John died on July 4, 1826, the 50th Anniversary of the signing of the Declaration, on the same day as Thomas Jefferson, the primary author of that document (James Monroe, the Fifth President, also died on July 4th, but no one remembers that — tell your friends and astound them with your knowledge of history!). Enjoy the Fourth! 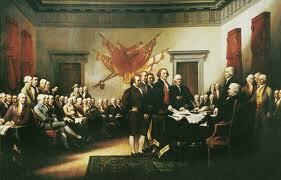 And, maybe, take a moment and read with your family the Declaration of Independence and the Gettysburg Address. I guarantee you’ll be glad you did! “It’s that time of year”, the song says, “when the world falls in love.” We hope those words come true for each and every one of you reading this entry. With all of you, we at GEM Theatrics hope for Peace on Earth and Good Will among all people. We hope that the times of strife in our country and around the world will soon end and that our leaders can find the right path. But the end of the year is also a time to reflect. For Mary Beth and me, this has been a year of professional growth as we saw our little theatrical business grow from a dream to something real, something we can be proud of. Over the course of the past 12 months or so, we brought Mary G. Kron’s wonderful telling of the story of John and Abigail Adams to life with performances of My Dearest Friend at Dog Story Theater last November, Davenport University this past September and The Red Barn Theatre in Saugatuck, MI in October. We also showcased the show in Traverse City in June for the Michigan Presenters Annual Conference and in November for the Michigan Joint Social Studies Conference in Warren, MI. Audience response has been enthusiastic everywhere we’ve performed and we are confident that this is an informative and entertaining look at two fascinating lives from our history. We are also thrilled to report that My Dearest Friend was accepted into the 2012 – 2015 Michigan Humanities Council Touring Directory. In order to be selected a short video from the show was reviewed by experts in the field, who judged it worthy of inclusion. What this means for non-profits looking to bring a quality entertainment to your venue is that grant money is available to underwrite 40% of the cost of hiring us! Just go to: http://www.michiganhumanities.org/programs/touring/index.php for more information. We also performed our signature piece, A. R. Gurney’s Love Letters, for two nights this past fall at Noto’s Old World Italian Dining as part of a dinner theatre package presented by StageOneGR, a new dinner theatre company founded by our new pal, Gary Morrison. We had a great time and the audiences got a superb meal and the chance to experience Mr. Gurney’s touching and funny play. But, year ends are also a time for looking forward. Assuming the Mayans weren’t correct about that end of the world thing, 2013 offers a host of new opportunities for us — and that means also for you! For those of you who have missed it so far, My Dearest Friend will be presented — in its entirety — Feb. 9 at the Kentwood Library, 4950 Breton Rd. SE, Kentwood,MI, at 2:00 pm. Admission is free! We’re very grateful to the library for this opportunity. Come on out and see us! In addition, details are being finalized to bring Love Letters to the Red Barn Theatre in Saugatuck, MI for the Valentine’s weekend. Save the date and stay tuned! More information to come! Helping make February an even busier month for us, we’re very pleased to announce that GEM Theatrics will be participating in the first annual Lake Effect Fringe Festival! We’re thrilled to be a founding member of this very exciting venture, along with Dog Story Theater, Pigeon Creek Shakespeare Company and Stark Turn Players. One of the purposes of the Festival is to allow entertainment groups of all stripes who may not have their own theatre spaces to come together for a month of eclectic presentations all in one venue. We’re hoping this annual festival of performing arts will expose these groups to new audiences who may not know of our existence, not to mention showcasing the wealth of talent that exists right here in West Michigan. Tickets for all shows will be just $10/$8. GEM Theatrics’ weekend will be Feb. 22 – 24, and we’re directing and producing two one-act plays by local playwrights. Based on the theme Working for a Living, we’ll be presenting Rock of Ages, by Mary G. Kron, about the effect of disaster on coal mining families, and the world premiere of The Interview, by Patrick M. Bailey, which deals with the issues of outsourcing. While some roles have been cast, we’re still looking for actors. Auditions will be January 12 and 13 and there is a link on the Home Page of this website for details. So, as you can see, we have a lot of exciting events coming up in 2013. We hope you’ll check this website often for updates and follow our page on Facebook. Until we see you somewhere down the line, have a fabulous and heart-warming Holiday Season!! For T. S. Eliot, April may have been the cruelest month, but for us at GEM Theatrics, September is the “coolest” month. We have a lot of activity to report and the best part is: you get to take part in most of it with us! We kick off right after the Labor Day holiday with two nights at the fabulous Noto’s Old World Restaurant performing our signature piece, A. R. Gurney’s “Love Letters.” For those who know about this unique and touching piece of theater, “Love Letters” tells the story of Andy and Melissa, who met in the second grade and continued a life-long friendship, suffering ups and downs, loves and hates, separations and reconciliations. The entire story is told through their letters to each other. Mary Beth and I met performing this show at the Grand Rapids Civic Theatre more than a decade ago. The show changed our lives (for the better); come experience it with us and maybe it will do the same for you! Shows are September 11 and 12. Dinner starts at 6:30p both nights, with curtain at 8p. Tickets are just $45 for dinner and the show (it’s Noto’s, the food will be superb!) or $25 for show only. More information can be found on our website; tickets can be purchased at: http://www.stageonegr.com. Bringing dinner theater to Grand Rapids is a new venture by our friend Gary Morrison, who began StageOneGR just for this purpose. We’re proud to be part of the opening season and wish Gary much success! The following week is Constitution Week, a week set aside to reflect on the founding of our nation and the principles we stand for. Davenport University is commemorating the week with our performance of the One-Act version of “My Dearest Friend.” We’re honored to be selected. While this performance is not open to the public, we hope to see many students there to share a little history and spark some discussion about what it means to be an American. If any of you work for a non-profit agency, you can bring “My Dearest Friend” to your venue and the Michigan Humanities Council will help you pay for it. We’re now part of the Council’s Touring Directory and grants are available! Go to http://www.mihumanities.org for more information. This just in!! We’re thrilled to announce that we will be performing the full Two-Act Version of “My Dearest Friend”, by Mary G. Kron, for two nights in late September at the Red Barn Playhouse, in Saugatuck, Michigan. This historic barn has been turned into a wonderful rustic theatre, but with all the production values one could require. The shows are September 28 and 29. Curtain is at 7:30p each evening and Tickets are just $15 or $12 for students and seniors. October was an important month in the Adams legacy: John was born in October, the Adamses were married in October and Abigail died in October. We also have a Presidential election right around the corner, so come out to get a glimpse into how it used to be! Tickets can be gotten from the Red Barn by calling 269-857-5300 or by email at lakeshorearts@comcast.net. We hope you will come out to one or both of these events and watch us play!! I know this should be two separate blogs, but we’re so busy at GEM Theatrics right now, that I’m making this one do double duty. First, we just found out that our production of “My Dearest Friend,” by Mary G. Kron, has been selected to be part of the 2012 – 2015 Arts and Humanities Touring Directory by the Michigan Humanities Council. We’re gratified by this selection! Every entry is judged by an “independent panel of experts in the appropriate humanities and arts fields” in order to be included. What this selection means is that not only was our show deemed worthy, but non-profit groups all over the state will be able to see our entry and, if they want to book us, will be able to get financial assistance from the Council to make the presentation of our show happen! The new Directory will be available online by August 1, 2012. If you know a school or library or museum that would like to bring a quality historical theatrical piece to their venue, let them know about us! Second, June 1, 2012 marks the 200th Anniversary of the beginning of the War of 1812. On June 1, 1812, President James Madison sent to Congress a declaration of the grievances against Great Britain and a request for a Declaration of War. Congress obliged on June 18. The grievances stated were: British interference with US trade with France, the impressment of US sailors who were former British citizens, and British support of Indian raids on US outposts in the territories. You might be thinking: “Gary, what has this got to do with John and Abigail Adams? Adams was defeated in 1800 and had long retired from politics.” All of that is true. But, what is also true is that, without John Adams, the United States might well have lost the War of 1812. We almost lost as it was. For the only time in our history, a foreign power invaded Washington, DC and burned government buildings, including the White House (in fact, the Executive Mansion wasn’t called the White House until after the war, when white paint was used to cover the charred exterior). The truth is that we only “held our own” during the conflict and our only real victory (Jackson’s defeat of the British in New Orleans) came after the peace treaty had been signed. That we were able to hold our own was largely due to the long out of office John Adams. Adams had managed during his presidency to avoid a much sought after war with France that surely would have decimated US capital and armaments. In addition, Adams was responsible for the growth of the US Navy, without which our ground troops would surely have been overrun by British forces landing on our shores. Adams had, since the Revolution, believed that sea power was the one force of arms that would establish the US as a true world power. In this, as in many other things, he was truly ahead of his time. US naval strength would prove itself time and time again to be of monumental importance in safeguarding American freedoms, and, despite the advance in nuclear and other weapons, is still a vital force in the world today. We at GEM Theatrics salute our Navy and all of our men and women serving their country at home and abroad in every branch of our armed forces. If you’d like to bring our bit of history to your venue, we’d be extremely pleased to hear from you to set it up! GEM Theatrics Celebrates Women’s History Month! On this International Day of the Woman, and the start of Women’s History Month in the United States, we at GEM Theatrics want to say “Here’s to the Ladies!” For myself, personally, I know that I am the luckiest guy around to have the love and support and talent and intelligence of Mary Beth, the other half of our business. I bet most of the other guys out there owe a lot to the women in their lives, too. But today, I want to focus just a bit on two women close to our theatrical lives — Abigail Adams and Mercy Otis Warren. If you’ve followed these blogs, you already know a lot about Abigail Adams and if you don’t believe by now that she was pretty remarkable for her time, maybe by the time I’m done you’ll be convinced. We also know, however, there were other areas where Abigail yearned for equality — barriers that even as liberal a man as John Adams couldn’t see fit to help her surmount. Perhaps the largest disagreement Abigail and John encountered in their more than 50 years together involved the question of equal rights for women. Don’t misunderstand me; Abigail was no Susan B. Anthony. She didn’t want the vote, didn’t want that responsibility, but she always firmly believed that women had a place in the social order of things and that place was not subservient to men. We’ve posted a short clip on the home page from “My Dearest Friend” by Mary G. Kron that illustrates her point of view: “I long to hear that you have declared in the New Code of Laws that you remember the Ladies”, she wrote John, “and are more generous and favorable to them then your ancestors. Do not put such unlimited power into the hands of the Husbands. Remember, all Men would be tyrants if they could.” John pooh-poohed her suggestion, and my personal view is that he probably never knew how much he hurt her by doing so (Adams was NOT a very empathetic person). But, WE know. We know, because of the friendship Abigail had with Mercy Otis Warren. Mercy Otis could have been a member of the Mayflower Society — her mother’s ancestors had come to this country on that fabled ship. Her father was a judge, a member of the Massachusetts House of Representatives and an ardent supporter of Independence for the American colonies. Mercy was “raised in the midst of revolutionary ideals”, one of which was the education of females. Like Abigail, she had no formal schooling, but was tutored along with her brothers in her father’s home. Also, like Abigail, she was a frequent and powerful writer. 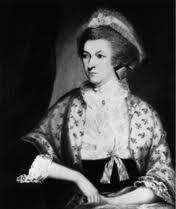 Under pseudonyms, she published poems and plays that attacked the British crown, and in 1805, under her own name(! ), she published a three-volume “History of the Rise, Progress, and Termination of the American Revolution”, the first such history written by a woman. making trial of the disinterestedness of his virtue, and when weighed in the balance have found it wanting.” We don’t know for certain, but it is likely that she never said anything of the kind to Adams’ face; it is only by virtue of the fact that letters can make us braver than we might be in person (email flames, anyone?) that we know of this dispute at all. So, during this Women’s History Month, we at GEM Theatrics remember two very special ladies: Abigail Adams and Mercy Otis Warren. What historical women inspire you? Let us know! We’d love to hear! ps — stay tuned for some very special news about an encore public performance of “My Dearest Friend”. Details are still to be worked out, but we’re very excited! As I write this, West Michigan is getting its first real snow of the season! Yep, the Holidays are here and I have a couple of gifts for you and some exciting news. First, the gifts — Check out our home page and you’ll find a new video taken right from the premiere of “My Dearest Friend” by Mary G. Kron that appeared at the Dog Story Theater in November. This short clip shows John and Abigail Adams celebrating the signing of the Declaration of Independence. For those of you not familiar with why we have parades and shoot off fireworks on the Fourth of July, listen closely to what John Adams says. There’s also another video from the show on the “My Dearest Friend” tab in the “Current Productions” menu on our website. Take a look at these videos and I think you’ll see what a quality production this is — one that you’ll want to see if it comes around again or to recommend to your group (school, library, museum, corporate outing)! Now the news — Our home page also provides information about our upcoming performance of our signature piece, “Love Letters” by A.R. Gurney on February 13, 2012 at the Grand Rapids Public Library. Mary Beth and I are delighted to be asked to share this tender and unique look at a fifty year relationship, told entirely through letters, for Valentine’s Day! Admission will be free, so mark the date on your calendars and keep checking the website for more details. Come watch us play! Last, the request — Websites are great, social media is fun, but word of mouth and personal connections are the best! If you saw our show and liked it, if you’ve been to our website (www.gemtheatrics.com) and were impressed with our product offerings, if you appreciate history and quality theater, then we need you to tell others about GEM Theatrics. Send your friends or associates to our website, let your child’s social studies teacher know about “My Dearest Friend”, mention our shows to colleagues in your office or at your social gatherings. Get these people to visit our site and fill out our new contact form. We can’t do it all — We need YOU! Mary Beth and I wish all of you a safe and joyous holiday season!